It was pretty relaxing in BC in the days before the team moved up to Camp I, but there were tasks to accomplish each day. We will have medical oxygen low on the mountain (19,100ft). We checked regulators and masks and went over procedures for flow rates for medical purposes. We spoke to Katie today in Kathmandu. She will depart on her international flight tomorrow. Yesterday, Sunday, Joanne, Ed, Katie Branham, Howard and Cassie all left for home as well. We miss our trekkers! But the memories of fantastic adventures together with the Sherpa people will live with us throughout the rest of this expedition and for the rest of our lives. Just before the Sherpas and climbing team members left, Ang Temba prepared the juniper that we will light on our chorten. The juniper fire always burns while climbers are on the mountain. 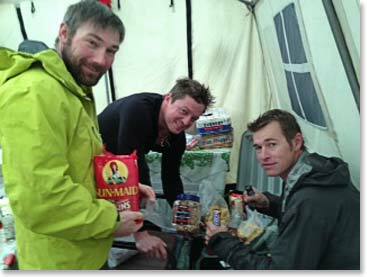 By the time the guys finished breakfast and the juniper fire was burning at the chorten, it had begun to snow lightly. 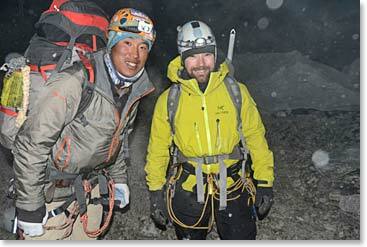 Climbing Sherpas Tashi and Jeyta had started a few minutes earlier than the climbing team. They carried loads all the way to Camp II today. Dawa, Steve, Daniel and Todd will remain at Camp I and they will likely spend the next five nights at Camp I and Camp II. 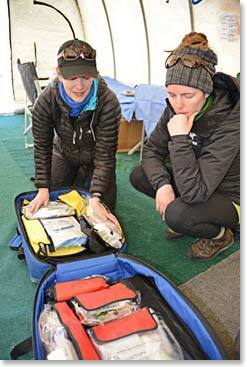 This will provide a tremendous head start to them in terms of their acclimatization and their familiarity with the mountain. 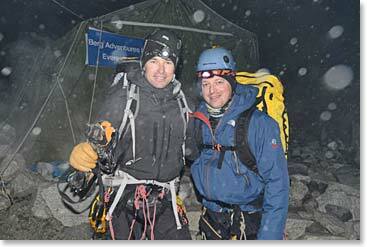 By midafternoon on Monday, clouds had partly covered the "Western Cwm" where the guys will be sleeping tonight. They have their biggest sleeping bags (rated to minus 40 degrees) and their big down jackets and pants with them - something tell us that they will be using them! We enjoyed visiting a Pooja early this morning at an neighbor's camp. 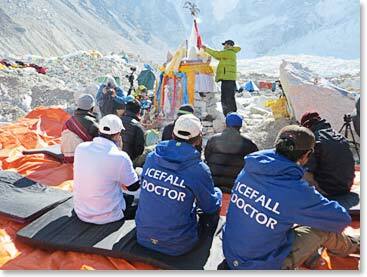 Some of the "Icefall Doctors" - the SPCC sherpas who establish and maintain the route on the lower mountain - were in attendance. These guy are amazing. 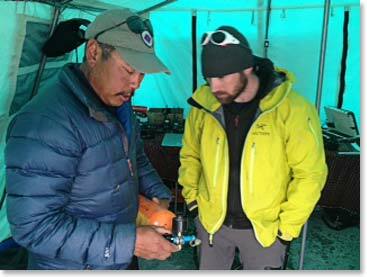 This year we are without Ang Nima, who died in his home in Dingboche a couple of months ago, but his experienced team is still at it. 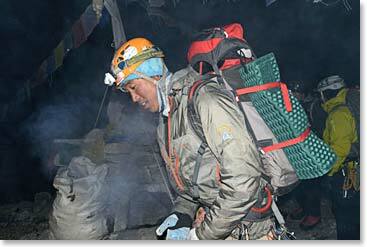 Sadly, in the first days of climbing this season, Ang Nima's son-in-law. 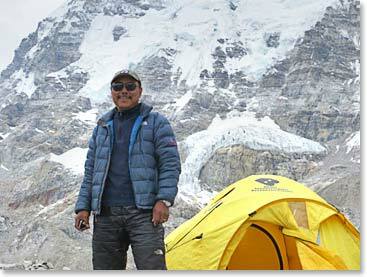 Mingma Sherpa of Dingboche, was lost in a crevasse fall while working on the route between Camp I and Camp II. We are honored to have a camp adjacent to "Doctors" this season. They have continued their work and a couple of doctors who had the morning off, were also present at the neighbors’ camp Pooja. Ang Temba prepares the juniper fire. 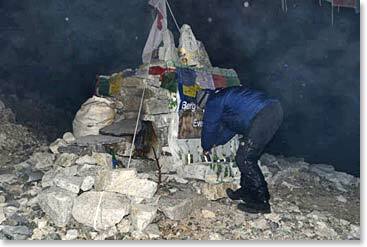 Dawa (Danuru) circles the chorten as he and the climbing team start out for their trip through the Icefall to Camp I today. 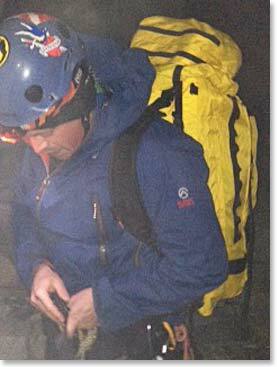 In the predawn darkness - just before 4:00am - Daniel buckles up his pack before heading into the Khumbu Icefall. By 10:00am the team had arrived at Camp I. 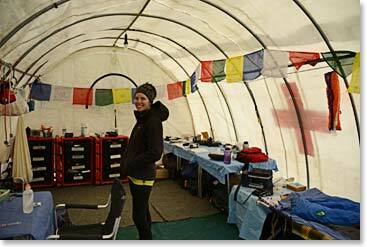 The Berg Adventures Climbers are all at Camp I but the pooja ceremonies continue at Base Camp as teams arrive and prepare for the season.